Did you play “Mother May I?” when you were younger? In the game you always have to ask the question and then the one at the finish line answers with the type of steps you are allowed to take. You may take five frog jumps. You may take four baby steps. Two backwards steps. Bunny hops. Kangaroo jumps. But everyone playing the game really wanted to take the giant steps. Giant steps got you closer to the finish line faster. In adoption, no amount of pleading with social workers, intake workers, and country coordinators can get you closer to the finish line sooner. There are no giant steps with adoption. Most of them are baby steps. Sometimes the only way to survive baby steps is to live daily. 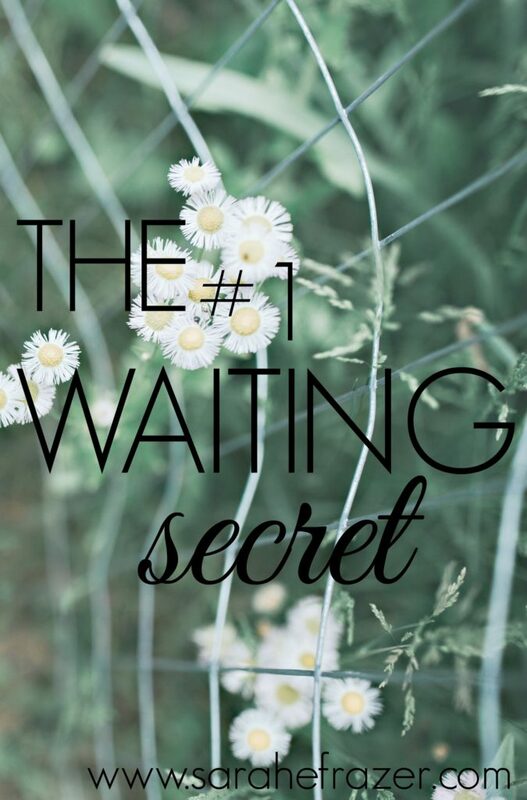 Did you know want to know the waiting secret? You only need grace for today. Strength for today. Love for today. You only have to wait one day at a time. When our waiting stretches from weeks to months, then to years, our hearts get anxious and we begin to worry. We are overwhelmed with the passing of time. We think back to all the months we’ve already waited. Then we look ahead to the finish line. We can’t even see the finish line. We don’t know how many little steps will get us from here to there. In our waiting, no matter the reason, we have to take small steps. One date at a time. One loving choice at a time. One day. Thinking about the weeks, months, and years of our wait will only discourage us. Today you can find the strength to wait, just one more day. I woke each day asking the Lord to give me strength FOR THAT DAY. Strength to have hope. Strength to do the things I needed to do. He gives us strength while we wait. Don’t give in to those feelings of hopelessness and despair. You can walk through your waiting with strength, because God is renewing you. Finding rest while you wait is about living in today. Rest in our God who loves you and is renewing you. What are you waiting for? I will pray just for YOU this week. Leave your request in the comments. I read every comment and value your thoughts. You so eloquently said EXACTLY what’s on my heart!!! Maybe we should join forces! 😉 Thank you so much for sharing at Waiting on…Wednesday! I LOVED this!!! Looking forward to hearing from you! I’ve featured your post for tomorrow’s link-up! I’ll hope you’ll join us! This is a beautiful idea. <3 I am waiting to learn whether my foster baby (with us for the fourth time in less than 2 years) will become my forever son. Thinking too far ahead makes me frantic and anxious. But today? I can handle today. Yes, Shannon. Just for today! Don’t think of the years that have passed or the future. Just in today. And you will be added to my prayer list this week! Hi, Sarah! 🙂 I’m stopping by from last week’s Grace and Truth. We are in a season of waiting to be approved for church-planting. In the meantime my husband is jobless. I was just telling him today as we traveled back from a meeting that the Father reminded me of how the manna He provided for the Israelites was only for one day at a time. Each day they had to trust Jehovah Jireh to provide for them while they waited to reach the promised land. One day. Just as you wrote here in this space. 🙂 Thanks for sharing these words with us! I found you because of Jen’s feature. So glad to discover you over here! Your opening reminded me of the middle of Dr. Seuss’s “Oh, the places you’ll go” where there is the “Waiting place” with couch. Made me smile. I know this struggle so well and you express it so eloquently. “You don’t know how you’ll handle tomorrow ~ You don’t have tomorrow’s grace and perspective,” has been one of my mantras. You are proclaiming the same thing over here. Love the kindred spirits I find as I hop around the sphere.